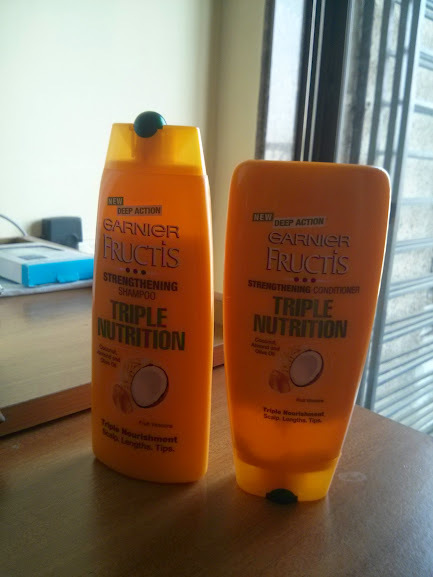 So I just got my hands on the all new Garnier Fructis Triple Nutrition Strengthening Shampoo & Conditioner. When they say Triple Nourishment, they mean it takes care of the Scalp, Lengths and Tips all three. That itself has got my attention. The yummy smelling products consist of fruit vitamins along with coconut, almond and olive oil. Is there anything left? I doubt! It seems to be a 'all in one' package to take care of every hair issue! Well, almost. Priced at Rs.135 each for the shampoo as well as conditioner, it is pretty reasonable and in lines with other brands. Maybe a combo offer with a discount guys? The packaging is very attractive with a bright yellow shade and the standard Garnier Fructis lid and upside down conditioner bottle. The products smell just wow, and though I have not used it yet, I am thrilled that soon my tresses will smell that way! It can be used daily and by all hair types. Now, coming to the condition of my hair at present. Well it is a pretty sad story. I had a c-section three months ago, and post that all the luscious awesomeness my hair was during pregnancy has gone. My hair are now limp, dull, lifeless and have split ends due to a long pending haircut/trim. I do oil my hair at-least once a week, but I wish I could do it every time I wash my hair. Due to the winter dryness, I also have bouts of dandruff, which I try to combat with anti-dandruff shampoos but they keep coming back. My hair are long, but lack volume and a ponytail is very thin. I think they get frizzy very easily and I have to compulsorily wash them at-least every alternate day (Girls with long hair, you know how time-consuming that is). 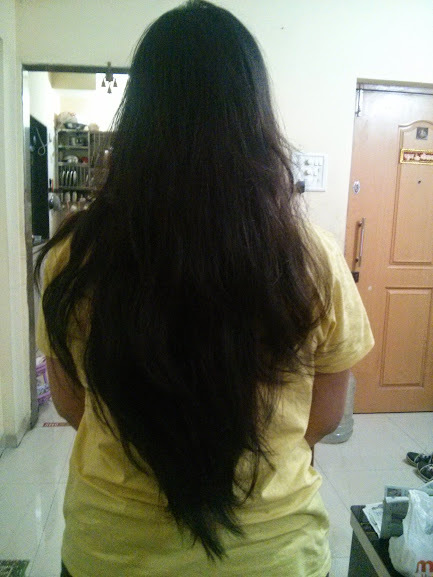 Wow even I did not know my tresses had grown so long. Without a proper haircut they look like a garden with overgrown grass longing for a trim. I'm not sure if you can make out the roughness in this picture. I am definitely getting a haircut soon. What I expect from the Garnier Fructis Triple Nutrition is to have my hair look visibly healthier, softer and happy! The next phase of my hair review will be after 15 days, once I have used the products at-least 7-8 times. Stay tuned! Very Nice post Avantika!!! I too like Garnier Fructis. I recently ordered this from Askmegrocery Coupons. here you can find some of the best genuine online jobs without investment and earn money also. Hey Folks,Worried about hairs ? Why not try some desi jugaad for it, read these amazing Dabur Amla Hair Oil Reviews and buy one Dabur Amla hair oil For you and your hairs. nice post..get beauty and health products at huge discounts using Big Basket coupons available at coupnchaska. Nice post to too like Garnier Fructis. Great effort... superb organic content. If you are interested in BEST DULHAN MEHNDI DESIGNS do have a look. Great effort... superb organic content. If you are interested in Masterpieces of All Salvador Dali Paintings With Meanings do have a look. This shampoo is very hard. My experience was not so good. fairly a worthy product to spend money on. It is quite good to know the information and if ot working best on my hair then i am the happiest now. Purely a must read article that included all information about the specific product. Surely a recommended products, i will check for the availability and order at Bigbasket using Bigbasket offers.